TOKYO – Asian shares got off on the back foot on Friday, while the yen nursed losses as traders wagered the Bank of Japan will add to its massive stimulus before too long. MSCI’s broadest index of Asia-Pacific shares outside Japan .MIAPJ0000PUS was down 0.3 percent in early trade, on track for a weekly loss of 0.4 percent. Major US stock indexes closed mixed on Thursday, with Nasdaq Composite .IXIC down 0.49 percent as Apple (AAPL.O) shares skidded to a two-year low on concerns about iPhone demand. 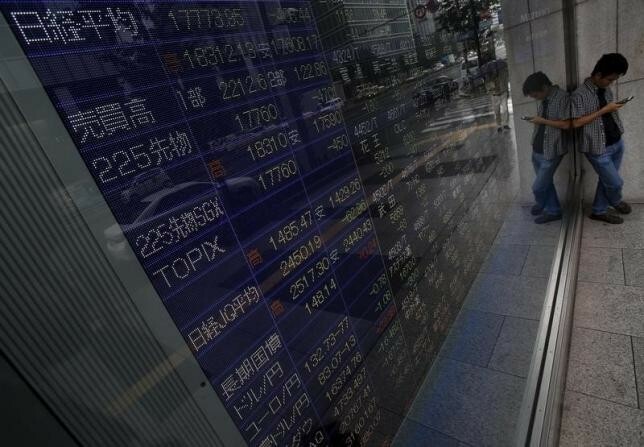 Japan’s Nikkei .N225 turned lower 0.2 percent in early trading, after a brief spike at the open. “Weaker yen and the quick rescue of Mitsubishi Motors by Nissan are both good news for the Japan market. This may relieve downward pressure on the Nikkei, despite Nasdaq’s slide yesterday,” said Hiroki Allen, chief representative of Superfund Securities Japan in Tokyo. Shares of Nissan Motor Co (7201.T) and Mitsubishi Motors Corp (7211.T) both rose on Friday, after Nissan agreed to buy a 34 percent stake in its smaller, scandal-hit rival on Thursday. The yen has weakened in most recent sessions as investors pared back long positions and Japanese officials explicitly warned about currency intervention. Also undermining the yen, a prominent academic with close ties to BOJ Governor Haruhiko Kuroda said on Thursday that the Bank of Japan is likely to expand monetary stimulus either in June or July with an eye on first-quarter gross domestic product data and the outcome of this month’s G7 summit. The dollar was steady against the yen on Friday at 108.98 JPY= after scaling a two-week peak of 109.40 overnight, moving well away from an 18-month low of 105.55 yen plumbed on May 3. The euro was slightly lower at $1.1374 EUR. Higher US Treasury yields also underpinned the greenback, after a pair of Fed officials said on Thursday that the US central bank remains on track to hike interest rates this year, though they didn’t offer clues on the timeline for tightening policy. Cleveland Fed President Loretta Mester, who has been less cautious about future rate increases than many of her colleagues, said that inflation measures have moved higher. She said even though there is uncertainty in the Fed’s economic forecasting, that should not stop the central bank from making monetary policy decisions. Boston Fed President Eric Rosengren, a voting member this year on the Fed’s rate-setting committee, said the Fed should raise rates again if second-quarter data confirms that the US labour market is near full strength and inflation is on track to accelerate. China will also release a spate of economic data over the weekend. The yield on benchmark 10-year notes US10YT=RR stood at 1.749 percent in early Asian trade, not far from its US close of 1.758 percent. Crude oil futures slipped after rising 1 percent in the previous session in volatile trading, as investors weighed a forecast for tighter global supplies and concerns about a major outage in Nigerian crude against signs of another storage build at the hub for US crude futures. US crude CLc1 fell 0.8 percent to $46.31 a barrel, moving away from a six-month high of $47.02 hit on Thursday but still on track for a weekly gain of 3.7 percent.